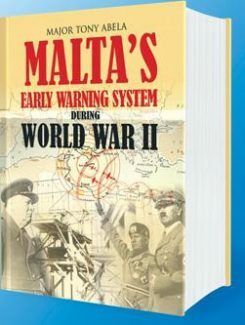 The story of the role that Malta played in helping Britain make full use of radar equipment during the war is told in a new book: Malta’s Early Warning System During World War II. Researched by Major Tony Abela, a former RAF telecommunications technician, it is based on information unearthed from hundreds of secret documents which, until now, had been stacked away for seven decades at the British National Archives. This is the fascinating account of a technological breakthrough which gave the Allies a propitious leg-up in achieving victory over the Nazis back in World War II. This is how radar was fully exploited for the first time in history. The story is about the pivotal role played in Malta in the development and successful use of radar by the British. It is a story packed with meticulous detail and backed up with an amazing amount of military documentation revealed here after seventy years of secrecy. Back in 1940 the invention of radar was pure magic; a painstaking achievement with consequences of unprecedented proportions. Far more than the atomic bomb, radar contributed to the Allied victory in the war. It was also the precursor of much modern technology. Discover here a story never told before, a story that changed the lives of millions. This was a secret war, whose battles were lost or won unknown to the public; and only with difficulty is it comprehended, even now, by those outside the small high scientific circles concerned. No such warfare had ever been waged by mortal men. Very interesting book for a history student like me 🙂 I totally suggest this book, as it is very helpful and the content is very well-explained and into detail 😉 This book makes me a bookworm! 😀 Excellent work and good job!